There are 2 tracks of our M.A. Program. One in Contemporary East Asian Studies and one specifically for Foreign Area Officers. Click the links below to find out more information on both! The M.A. in Contemporary East Asian Studies is an interdisciplinary degree focused on 20th and 21st century East Asia. 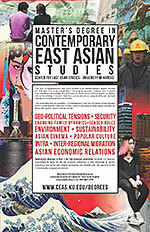 This program provides students with in-depth interdisciplinary knowledge of a selected East Asian country (China, Korea, or Japan); a broad knowledge of modern East Asia; and social science research skills and methods appropriate to international area studies.Two concentrations are available, 1) Contemporary East Asia 2) Foreign Affairs Studies (FASt): Contemporary East Asia in Global Content. A special track is available for foreign area officers.